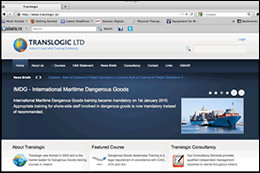 Translogic Ltd, is the market leader in Dangerous Goods training in Ireland and a key provider of numerous general training and mandatory accredited training courses. All courses are given by highly qualified and experienced instructors and carefully monitored by the relevant authorities e.g. IATA, Irish Aviation Authority and the Department of Transport. Translogic Limited was established in 2002 as the specialist training division of the IAM Group of companies. Translogic provides general and cargo related training courses including air cargo security, transportation of dangerous goods, customs procedures and the Department of Transport passenger security training module. Translogic is government approved and is accredited by state bodies to provide mandatory training. All instructors are highly qualified and experienced, and approved by the appropriate authorities i.e. IATA, Irish Aviation Authority, JAA of Europe, the Departments of Transport and Health & Safety. Training schedules can be tailored to meet specific client needs with the option to run courses on site, at customer premises or at Translogic’s own modern training suite in Dublin. CLICK HERE to visit the Translogic website for more information.